I hope members will vote NO. What the employers are offering is fundamentally not in the long term interests of the union members. Nor is it in the interests of the institutions which wish to offer good pensions as part of an attractive remuneration package. The pre-92 universities surely do not want to be in the position where they are offering pensions that are inferior to the post-92 sector. We have been challenging the methodology by which the USS is valued. The trustees have made assumptions about the distant future that are overly pessimistic in the name of prudence. But if prudence is taken too far it means members have to pay huge sums to compensate undermines the whole basis of the scheme. Most of the deficit (if not all) is caused by this. We are told the deficit is thought to be about £12 billion - but over £5billion is due to a policy of 'de-risking' that we are being asked to agree to. This means we agree to the USS adopting a policy of not investing long term as it always has tended to in the past in order to get the best income - but instead investing in low-yielding government bonds (gilts). So we are having to pay for this. The rest of the deficit is due to overly prudent assumptions - expecting high inflation in the future, higher salary growth than in the past, increased longevity (the employers pension forum were found out to have made outrageous claims about life expectancy in the USS increasing faster than ever into the indefinite future and were forced to withdraw by Warwick statisticians), continued poor economic growth, continued very low interest rates, etc. If they can think of a risk they put it in and charge for it. The UCU commissioned a report from First Actuarial that proved that if the scheme is valued on an ongoing basis (like the TPS) it might very well not be in deficit. They asked for further information. The negotiators however seem to have ignored this report and have apparently accepted the trustees' agenda. Certainly they have said nothing about it in their email to members. We should be negotiating on the basis of the FA report. Our negotiators should be asking for the data that FA have asked for in order to carry out a proper valuation on an ongoing basis. The USS dispute is primarily a matter of ideas and ideology rather than simply money. The deficit - a hypothetical monetary magnitude - depends fundamentally on what is assumed about the future of higher education, specifically that part of it in the pre-92 sector. This has been shown in many of the employers' individual responses to the UUK consultation (including Warwick, LSE, Imperial, Cambridge, Essex, Aberdeen, Oxford) that the deficit is only as large as the trustees claim it is because they are making assumptions that are far too pessimistic. And the letter a group of leading actuaries wrote to the trustees showing that there may not even be any deficit at all if the right - while prudent - assumptions are made. But the most significant demonstration of this of all is the report by First Actuarial, prepared for the UCU, that focused on the central role in the valuation of the key assumption concerning the future of higher education itself. They showed in effect that if the pre-92 university sector is assumed to have a future - not unreasonable one would think - such that its pension scheme the USS has an ONGOING BASIS (rather than the limited period of only15-20 years secure lifetime assumed by the trustees) then the deficit could well turn out to be negligible if only the accounting could be done on this basis. The report is a comprehensively researched and carefully argued study (and the only one that bases its analysis on projected income and expenditure estimates for the indefinite future). The deficit is therefore ideological in essence. The trustees (led by USS chief executive Bill Galvin) are following a different ideology and are manipulating the deficit accordingly by making overly prudent assumptions. They have assumed too high salary growth, too much inflation, overestimated increases in longevity, underestimated economic growth and assumed that very low interest rates will continue indefinitely. If there is a pessimistic assumption that can be made the trustees have made it. Some of their assumptions are contradictory (such as very rapid salary growth combined with continuing recessionary conditions). By making appropriate assumptions about future trends there is enormous scope to find there is a deficit if that is what you are looking for. Or not. Such is the power of compound interest! That begs the question: what has changed since the scheme was supposed to have been sorted out in 2011 when the recovery programme was implemented. It can hardly be true that life expectancy has increased since then, and economic growth has resumed, salary growth stagnated, inflation fallen. The big change is that the government has withdrawn. The USS originally had a trustee representative of the funding councils, alongside those representing UUK, UCU and independents. When the scheme was set up the assumption was that the government via HEFCE could act as guarantor. And it was at that time axiomatic that these universities would pretty much continue to exist indefinitely and therefore the pension scheme would have an ongoing basis. The government seat was abolished by the coalition, presumably as part of the marketisation madness of David Willetts; and that far-reaching constitutional change was made with a minimum of fuss, its announcement being buried away in the 2012 report and accounts as a fait accompli. It was not even mentioned in the chairman's report. So the USS now finds itself as a pension scheme for a group of institutions operating in a market, the future nature of which they know nothing about, and this uncertainty is the source of the deficit figures. We can say that the deficit is a result of the government's marketisation obsession together with the ideology underlying the valuation methodology preferred by the trustees. The trustees' deficit is not money that is having to be paid. In fact the scheme is not in deficit in the ordinary sense: it makes a large surplus every year of over a billion pounds which is invested long term. The trustees' deficit is an idea. As part of the negotiations about the future of the USS pension scheme, the UCU commissioned First Actuarial to comment on the assumptions being made by the Trustees which have been criticised for being excessively prudent and pessimistic. The paper provides detailed estimates based on a different methodology that assumes the university pension scheme will continue into the indefinite future (since it applies to a whole sector of the economy) rather than being prepared for closure. It also shows that the trustees' approach creates a vicious circle of self-fulfilling pessimistic assumptions. The report is highly recommended as a carefully argued, forensically detailed demolition of the trustees' case. The paper shows that if the scheme is viewed on an ongoing basis - having a very long or infinite time horizon - and where the chance of the institutions failing to support the scheme is very small - then there is no deficit or at most a very small one that does not necessitate the kind of radical changes being proposed. The report is quite technical in places requiring a good grasp of the arguments and jargon. But its main message is easy to take away. The report raises a number of questions for the USS officials and the trustees to answer in order to give a fuller picture. We are concerned that ... you risk recommending a major downgrading of one of our employees’ most important benefits based on numbers which are as likely to be modelling artefacts as a reflection of the underlying economic reality. too short a time horizon for the employer covenant (one more appropriate to a private company than the university sector). There is an element of circularity in the reasoning - much of the deficit is due to the expectation of poor returns in the future (because of the gilts-based approach) and the short 20-year time horizon for the employere covenant - which in turn is said to be necessary because of the unwillingness of employers to pay high contributons due to the deficit. The assumptions are chosen in a manner which is economically incoherent - buoyant salary growth assumes a strongly growing economy while poor investment returns assume an economy permanently in recession - both these assumptions serve to inflate the deficit. All the assumptions made assume a 'worst case' scenario. The combined effect is to be unduly pessimistic. The estimates obtained by the trustees' approach exhibit wild swings, with rapid instability over a period of months in the estimated liabilities, while the real liabilities are known to vary very slowly on a decadal beasis. ...moving to evidence‐based assumptions on salary growth and RPI would show the scheme to be in healthy surplus on a neutral assumptions basis. Remove the derisking assumptions and that surplus would be substantial. Substitute historic asset growth performance for Gilts plus and the neutral basis would show a very substantial surplus. The word ‘deficit’ normally means the amount by which income falls short of spending. That is not what is meant here. The USS is actually in surplus in the normal sense. But the term ‘deficit’ is being used as a technical term to mean a balance-sheet shortfall between the liabilities and the assets. This is a theoretical stock of capital rather than money that necessarily has to be found in the ordinary day-to-day business of things. It is a bit like negative equity on a house. If house prices fall many people will find their mortgage debt greater than the value of their house: a situation known as negative equity. That happens fairly often and is not usually regarded as a problem that has to be dealt with. We see it as merely a temporary situation until house prices recover in the normal course of the economic cycle. It does not mean that the householder has to suddenly find the money to pay off the difference. Another analogy might be the national debt. It never has to be paid off and causes no problems as long as the government can pay the interest, something it has never been unable to do. But we are being told the USS pension deficit must be paid off as soon as possible regardless of the state of the economy. It is rather as if your mortgage lender was telling you to find the cash now to pay off your negative equity in an emergency recovery plan. The UCU is contesting the valuation methodology. How is it possible to do that if the law is clear that pension schemes must be valued every three years? Things are not black and white. There is not a single natural way of valuing a pension scheme. Any valuation depends very heavily on economic theory, and there are different theories about what a pension scheme is. The law allows for different approaches to be used. However the regulator, many actuaries, trustees and accountants tend currently to be taking an approach that would at one time have been regarded as overly prudent. Prudence can be taken to extremes such that instead of leading to a cautious appraisal, the survival of the pension scheme itself is threatened. This has been dubbed ‘reckless prudence’. Traditionally the actuaries used to take a long term view taking account of the likely income earned by the investments in the future in relation to the pension promises. This would allow for temporary effects due to the inevitable economic cycles. This approach (known as smoothing) is not allowed to be used under the rules that are being applied now. Valuations must be based on an ideal theory that markets are efficient and no judgement or forecast can be any better than that of the market. So actuaries cannot take a view in the way they used to do. Essentially there is no room for macro-economics any more. There is only the micro-economics of the efficient markets hypothesis. But the efficient markets hypothesis is contested by economists, actuaries and accountants. The fact that this approach is being effectively imposed is market fundamentalism, based on a neoliberal world view. The law states that the assets of a pension scheme must be valued at market prices. There has to be a valuation every three years on March 31. The theory behind this is that the assets are the fund out of which the pension promises are paid. But for a very large scheme like USS that is not a very practical concept because it is not possible to sell large quantities of assets (currently about £40 billion) without causing a crash. But it is not really market prices that matter so much as the income that the investments will bring. Earnings from dividends, interest, rent and so on are what are important. Yet these are ignored. The idea of using the market prices of the assets to assess the health of the scheme comes from a particular economic theory known as the efficient markets hypothesis that holds that the market price of an asset reflects all future information about the earnings the asset can yield. So it is not necessary for the actuaries to forecast the future income because the market – as if by magic - has already done the work for them. This is an elegant theory with very little if any empirical support. In fact all the empirical evidence shows that asset prices are very much more volatile than earnings from dividends etc. These fluctuations in asset prices reflect short-term macro-economic and political conditions external to the scheme and are not directly relevant to the solvency of the pension scheme in the real world. How are pension liabilities calculated? The liabilities are the most problematic part of working out the funding position, because the liabilities are long term promises of pension benefits into the distant future. The methodology relies very much on economic theory and produces a figure that is not only highly volatile like the assets but also the methodology behind it is highly questionable anyway. The figure derived for the liabilities only makes sense under very strong and unlikely assumptions. The idea is to calculate what would be a suitable sum of money that would enable all the pensions promises to be paid on the assumption the scheme were wound up. That is the theoretical basis. This requires an assumed notional rate of interest known as the discount rate. We are told that prudence dictates that we cannot assume interest rates will every again increase above their current very low level. The economy will never recover. Also prudence dictates that we assume the worst about life expectancy, future inflation, future pay rises, and so on. Thus we must assume that pay continues to rise faster than inflation (despite recent experience to the contrary) yet the economy does not grow at anything like that rate. Also we are told by the EPF that life expectancy is growing at something like almost six years every decade despite evidence from the Office of National Statistics that it is more like less than two years. The economic model that drives thinking on this is where the pension scheme belongs to a company that might go bust (or maybe the chief executive might steal all the pensioners’ fund then commit suicide as happened with Robert Maxwell at Mirror Group). In the case of the USS it is a group of universities. But the USS is a huge scheme covering an industry rather than a firm. This model does not fit the reality. It is said by many critics that the USS is very poorly managed. Isn’t the problem that the scheme does not invest its fund well? The USS is often criticised for having invested in the wrong sort of assets. It is heavily overweight in equities which are risky and it needs to rebalance. This argument has been around for a long time and has never been rebutted. It is fallacious and allowing it to go unchallenged has done a lot of damage to the reputation of the USS. The argument is that equities – that is stocks and shares of companies – are inherently volatile in that their prices vary a lot over time. So a prudent pension scheme should not rely on this type of unreliable asset class too much. 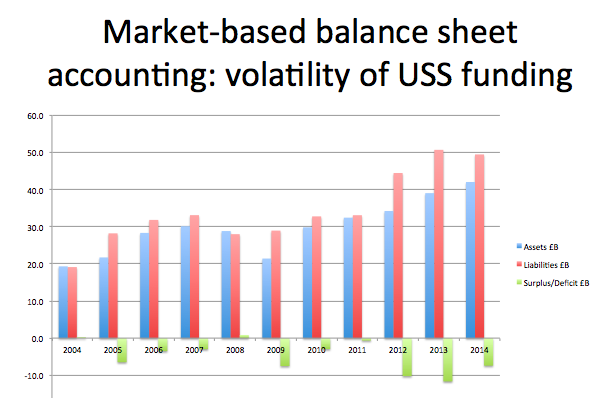 USS has traditionally invested in equities and has too many in its portfolio. This argument is wrong. A pension scheme like the USS covers a whole industry – a public service actually, higher education – so it has a long time horizon. It is not like a pension scheme for a company that might have a finite life cycle and then go out of business. In that case it makes some sense to get out of risky equities as the members approach retirement because there needs to be a secure income to pay the pensions. The USS has to invest its surplus of over £1 billion per year. Where should it invest if it is to get the highest return? Increasingly it is investing in alternatives which includes infrastructure. It recently bought a large chunk of Heathrow, NATS, Sydney airport, etc. These investments share many of the characteristics of equities – they give a good long-term return that matches the long-term nature of the liabilities. It sounds like something we should all want – getting rid of risk is like being against sin – but it is actually a technical term used in the pensions industry. Many DB pension schemes are closed to new members or future accrual. Most of their income comes from investments. As the members approach retirement and retire the need is for the income to become more secure. The investments are moved from risky but rewarding assets like equities to safe assets like government bonds (gilts). The trouble is that the same logic is being applied to the USS – it is being treated as if it is to close. So holding a diversified portfolio will cease to make sense. If assets are moved to the lower earning gilts then the income lost has to be found. Hence the cost of doing that is being added to the deficit. That has to be paid in increased contributions or reduced benefits. Why is this logic being applied? It is not necessary that the USS be regarded in this way. It is an infinitely long-lived scheme. The only thing that will lead it to fail is if members do not join it – and making them pay for de-risking is one way of ensuring that happens. A policy of de-risking is not reducing risk at all. In fact it is increasing the risk. The employers are not saying that they want to address a deficit of 'only' £8billion. They are saying that the deficit is unsustainable because it is going up to £13billion as a result of derisking! According to their latest briefing the UCU negotiators seem to be ambivalent about de-risking. They should reject it entirely on principle. We should defend the USS as a sector-wide pension scheme with an infinite lifetime continuing into the indefinite future. The regulations are laid down in general terms in the Pensions Act 2004. Pension schemes must be valued every three years. How this is done and the procedure when there is a deficit are described in the code of practice in the associated order in council, here. But the most problematic clause is 128 which rules out smoothing on the grounds it is inconsistent with the strict market prices. This means that a very strict theory of market prices is taking precedence – market fundamentalism. It is based on the belief that markets are perfect and effiicient. So what is the nature of the crisis? The legislation gives wide discretion to the trustees and the regulator. The regulator is concerned primarily with protecting the pension protection fund from any claims on it. The regulator does not have to give priority to providing a good pension scheme for members. The trustees ought to be taking a view. In the case of USS it is usually thought of as long lived (an immature scheme). So the deficit does not matter - it is cyclical and will disappear as soon as interest rates on gilts increase. But they are not thinking in these terms any more. They are in Willetts' world of competition between universities that are treated not as public bodies but private companies operating in the market place and competing with new entrants. There is no difference essentially between, say, Oxford and BPP university. If a university fails to attract enough students it will be allowed to go broke. So from this point of view prudence requires a need to have its pension promises funded at all times. That is its share of the USS. Hence the deficit begins to matter enormously. So although the sector as a whole is presumably not going to go bust each individual institution can do so. This new thinking - privatisation - is what lies behind the employers thinking. That is why they want to introduce de-risking. Nothing to do with equities not being a good investment. Equities are the best investment for a long-term pension scheme like USS if it is seen as covering the whole sector. They have a higher return and the risk can be borne because it does not matter in the short term - the pension scheme does not need to draw on its assets in the short term. Today's THE contains an important letter by some of the country's leading academic actuarial scientiss pointing out that the assumptions being made by the USS are unduly pessimistic and contribute greatly to showing a deficit. A question frequently asked is: given that the changes introduced three years ago were part of a recovery plan to eliminate the deficit, what has changed since then that necessitates further radical changes? One important change is that the constitution of the USS has been amended in a significant way. There is no longer a representative of the University Funding Councils.That is there is no longer a director appointed by central government. This is explained in the Board Report in the 2012 Annual Report and Accounts. "Previously the Higher Education Funding Councils (HEFC) were entitled to appoint one director. As part of a review of their activities and responsibilities, the HEFC nominated director resigned and, at the request of the funding councils, the articles of association were amended to remove references to the funding councils." This reflects the Coalition privatisation thinking about universities. I have just given a talk to an open meeting organised by the Birmingham University UCU. If anyone would like to read my power point presentation, it can be downloaded from here. I have just read an article by Jack Grove about the USS dispute (Universities unveil firm pension proposals) which is very very misleading. He writes that there is a deficit of £8 billion PER YEAR. That is wildly incorrect. The deficit is not an annual payment. It is a notional capital sum and as such has no time dimension. There is no "per year" deficit. In fact the latest Annual Report shows that the scheme makes a net surplus of £1 billion per year. He also repeats the employers' claim that a reason for the deficit is poor investment returns after the financial crisis. In fact the USS's investments did well last year making a relatively good rate of return of 7.6 percent. It did not do as well as the Prudential but its performance was one of the best among pension funds. Whatever the reason for the deficit it is not poor investment returns.